Spending February: A To-Do List for Adventuring Through the Month. | The girl who loved to write about life. There are two types of people in February: Those who acknowledge that Valentine's Day is a date on the calendar in February, and those who try their best to make the entire month about Valentine's Day. Clearly, I am the latter. There are 29 days this month! I hope you spend them well. As always, I have some suggestions for how to do that. 1. Take a look at your New Years goals. It's been a month...how are you doing? 2. Make chocolate covered strawberries. 3. Sit down with your planner and calendar and get organized. Just because it didn't happen in January doesn't mean the whole year is a wash! 5. Go through your closet. The stores are starting to fill up with spring clothes, but before you spend any money, go through what you already have. You never know what forgotten treasures you'll find hidden in the back of your closet! 6. Go check out the dollar spot at Target, filled with pink V-day goodness. 7. Distance yourself from your phone. You should be able to set your phone down (or even better, turn it off) for a few minutes or hours without it ruining your day. Especially if you're spending time with other people. 9. Get outside! Chances are, you spent most of January indoors, so treat yourself to some fresh air. 10. Celebrate Valentine's Day at home. 11. Find an at-home workout you love. 12. Mail some Valentine's cards. 13. Wish your lady friends a happy Galentine's Day. 14. Celebrate Valentine's Day! Make it an all-day affair! 15. Clean out your bathroom drawers. Throw away the lipgloss you bought four years ago and are saving just in case you ever get tan enough to be able to pull off that shade of pink. 16. Write your significant other a love letter. The cheesier, the better. 17. Go through your emails and unsubscribe from all of the lists you mysteriously ended up on. 18. Surprise someone with chocolates. 19. Start thinking about who you might be voting for in November. 20. Make an effort to smile at everyone you come in contact with for a whole day. 21. Go the month without buying coffee outside of your house. Learn to make a really good cup at home, it's life-changing. 22. Spend some time thinking about what's really important to you. Being at home with Jack for the past two weeks has taught me that life is short, but we also do get so much time...we just have to decide how to spend it. So think about the most important things to you, and make sure the way you're spending your time reflects that. 23. Laugh more. Lose the self-imposed pressure to be serious all the time. 24. Think about your words. They're important and should be treated like they are. A good rule to use when you're not sure if you should speak up is to ask yourself: Does this need to be said? Does this need to be said by me? Does this need to be said by me right now? 25. Make a workout playlist. 26. Throw away your mugs. Do you find yourself reaching for the same few mugs every morning, but keeping 20 others "just in case you need them?" Toss 'em. 27. Re-watch the pilot (or finale!) of your favorite show. 28. Throw a "favorite things" party. Like Oprah, but better. PS: this would be a really fun date night. 29. Spend your extra day! We have an extra day we won't get again for four years...spend it doing something fun! I always love your monthly lists. I have never made chocolate covered strawberries, but that sounds fun. I buy myself flowers on the regular from the grocery store. They're inexpensive, last longer and brighten the mood in the house..I love doing that! Also- can I have your address please? :) You can send it through e-mail if you'd like! I absolutely love this list! 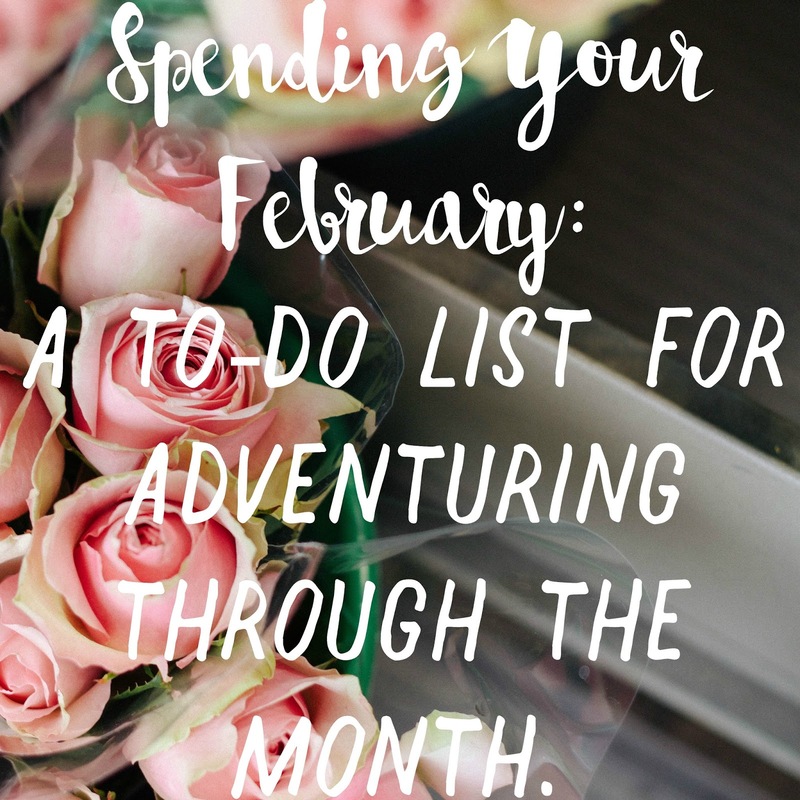 All of the items listed are such great things to do this month and I am beyond excited to try a few new things such as making chocolate covered strawberries, buy myself flowers, and send my best friends Valentine's day cards :) Thanks for sharing this list! #24, YES! I've been thinking about the importance of words lately and how often things are worded in a way that are manipulative or how often someone will use a word to describe something in a way that makes it more negative than it actually is and how that can influence how things are perceived. These are great! I love GALentine's day and its concept! This is great!!! I tend to have snarky feelings about Valentines Day just because of past experiences.. I'm going to try and change my mindset and make the whole month about love. I love the inspiration to clean out your closet too! That is much needed! Great list for this month! The perfect mix of productivity and celebrations :) I'm constantly working on my time management and the more we declutter, the more time I realize I have. I'm spending less time picking up/putting away junk and more on the things that matter! Chocolate covered strawberries sound amazing! This is such a fun list! I should definitely make chocolate covered strawberries! Love these ideas! Thanks for sharing them with us. The dollar spot at Target is KILLING it right now. I am such a sucker for anything pink or red or heart printed! I totally need to go through & delete all of those unnecessary emails I get everyday. Such good ideas! I love this list! Especially cleaning out the closet before buying anything new! The "favorite things" party sounds like so much fun! I also love your idea of buying yourself flowers! February is the month of love so you might as well show love to yourself, right? Love this! I am definitely the latter as well, why not celebrate a whole month of love? I love this February to-do list! Before my husband started dating me, he didn't even know that Valentine's Day was on the same date every year, so obviously we don't go big in our home. But we are planning a special out-of-town vacation this year, so that will be fun. What a fun list of things to do this month! I especially want to buy myself some flowers and have a galentine's day with my gals! Oh, and it was as if you saw in my cabinet when you said that about the mugs... I DO need to get rid of quite a few! ohhh please fill me in on your new workout playlist! i'm always looking for new pump up jams! This is awesome!!! What a great list! what a great list! i especially like the one about unsubscribing from e-mail lists you no longer want to be on. Your list is really fun! I'm shocked at your awesome list while having a new born at the same time! You rock!